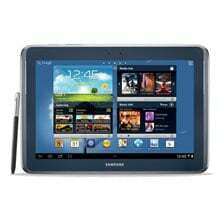 The Samsung Galaxy Note 10.1 has been discontinued. No direct replacement is available. Boost Your Productivity at the Office, School or in the Field. Push the boundaries on what you view""and now what you can create""on the new Samsung Galaxy Note™ 10.1. With the innovative S Pen™ you can express creative ideas and increase your productivity like never before. Discover powerful performance and maximized storage capabilities. Enjoy the many benefits of a quad core processor, Android 4.1, Jelly Bean and microSD card slot for expanded storage. 10.1" Screen, 2GB Standard, 16GB Flash Capacity, 1.40 GHz, Wi-Fi, Android 4.0 Ice Cream Sandwich. Includes AC Adapter. 10.1" Screen, 1GB Standard, 16GB Flash Capacity, 1.40 GHz, Wi-Fi, Android 4.0 Ice Cream Sandwich. Includes AC Adapter. 10.1" Screen, 1GB Standard, 32GB Flash Capacity, 1.40 GHz, Wi-Fi, Android 4.0 Ice Cream Sandwich. Includes AC Adapter.